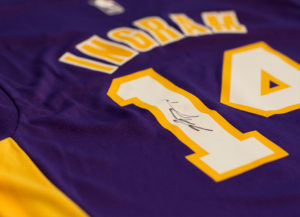 Eligibility: The Ingram Jersey Sweepstakes (the “Sweepstakes”) is open only to legal residents of the 50 United States and the District of Columbia who are 18 years of age or older at the time of entry. If you are a minor in your state of residence, you must have the consent of your parent or legal guardian to enter. Employees and non-employee workers of DJO Consumer, LLC and its respective parent companies, subsidiaries, affiliates, and agents, and those prize providers and agencies that are involved in the development or execution of this Sweepstakes or any of its materials, and the immediate family (spouse, parents, siblings, and children) and household members of each such person are not eligible. The Sweepstakes is subject to all applicable federal, state, and local laws and regulations and is void where prohibited by law. Sponsor: The Sweepstakes is sponsored by DJO Consumer, LLC, 1325 Sycamore Ave Ste B, Vista, CA 92081 (“Sponsor”). Promotion Period: The Sweepstakes begins at 11:00am Pacific Standard Time (“PST”), July 26, 2017 and ends at 2:00 p.m. PST, July 28, 2017 (the “Promotion Period”). Drawings: There will be a drawing to win the prizes described below on or about July 28, 2017. On the drawing date, Sponsor will select the name of two (2) potential Grand Prize winners and ten (10) potential First Prize Winners in a random drawing of all eligible Entries received during the Promotion Period. The potential winners will be notified by direct message on their Instagram account; entrants agreed to be so notified and to maintain their account in a manner to allow such direct messaging If a potential winner fails to respond within five (5) days of notification or any notification is returned as undeliverable, Sponsor may select an alternate winner in a random drawing. The odds of winning a prize depend on the number of eligible Entries received during the Promotion Period. One (1) Grand Prize will be awarded, each consisting of signed Los Lakers jersey of Brandon Ingram. Approximate Retail Value of each such Prize (“ARV”): $199.99. General Conditions: In the event that the operation, security, or administration of the Sweepstakes is impaired in any way for any reason, including, but, not limited to, fraud, virus or other technical problem, the Sponsor may, in its sole discretion, either: (a) suspend the Sweepstakes to address the impairment and then resume the Sweepstakes in a manner that best conforms to the spirit of these Official Rules; or (b) cancel the Sweepstakes and award the prizes in a random drawing from among all eligible Entries received up to the time of the impairment. The Sponsor reserves the right in its sole discretion to disqualify any individual it finds to be tampering with the entry process or the operation of the Sweepstakes or to be acting in violation of the Official Rules of this or any other promotion, or in an unsportsmanlike or disruptive manner. Any attempt by any person to undermine the legitimate operation of the Sweepstakes may be a violation of criminal and civil law, and, should such an attempt be made, the Sponsor reserves the right to seek damages from any such person to the fullest extent permitted by law. The Sponsor’s failure to enforce any term of these Official Rules shall not constitute a waiver of that provision. Disputes: Entrant agrees that: (a) any and all disputes, claims and causes of action arising out of or connected with this Sweepstakes or any prizes awarded shall be resolved individually, without resort to any form of class action, and exclusively by the United States District Court for the Southern District of California or the appropriate California State Court located in San Diego County, California; and (b) any and all claims, judgments and awards shall be limited to actual out-of-pocket costs incurred, including costs associated with entering any Sweepstakes, but in no event attorneys’ fees. All issues and questions concerning the construction, validity, interpretation and enforceability of these Official Rules, or the rights and obligations of the entrant and Sponsor in connection with the Sweepstakes, shall be governed by, and construed in accordance with, the laws of the State of California, without giving effect to any choice of law or conflict of law rules (whether of the State of California or any other jurisdiction), which would cause the application of the laws of any jurisdiction other than the State of California. Winner List: For a winner list, visit donjoyperformance.com/blog. The winner list will be posted after winner confirmation is complete.